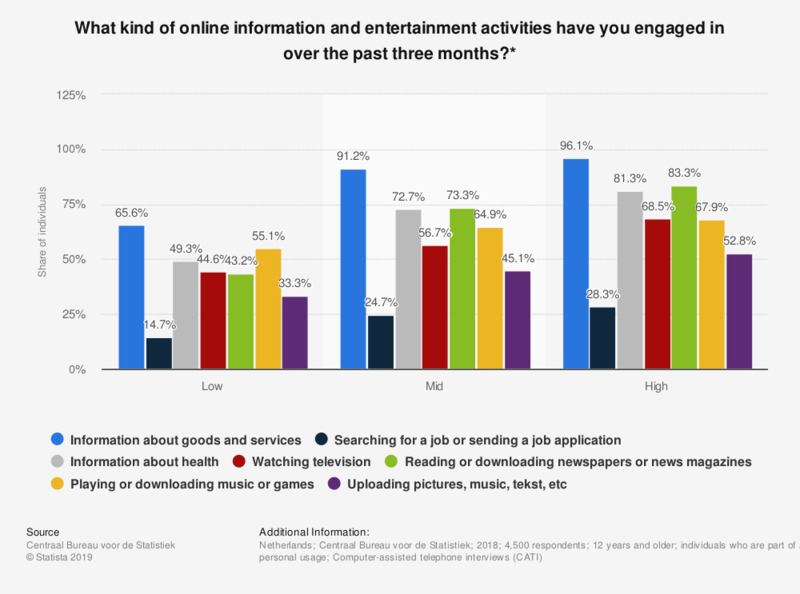 This statistic shows the responses to the survey question: "What kind of online information and entertainment activities have you engaged in over the past three months?*". The figure illustrates the share of individuals who used the Internet for online information and entertainment activities in the Netherlands in 2018, by education. As of 2018, 28.3 percent of highly educated individuals answering the survey question said they used the Internet to search for a job vacancy or to apply for a job. * Original survey question: "Did you use internet in the past three months for one of the following activities: to find information about goods or services; to use services in the travel branch; to look for a job or apply for a job; to find information concerning health; to listen to the radio; to watch television; to read or download newspapers or news magazines; to play or download games, images, movies or music; to upload self made pictures, music, video's, text or software; to download software other than games". Low education level: "Primary education, VMBO (preparatory middle-level vocational education), first three years of HAVO/VWO (higher general and pre-university secondary education), or assistant education (MBO-1)"
Mid education level: "Last years of HAVO/VWO, MBO2, 3 and 4 (middle applied education)"
High education level: "HBO (higher applied education) and WO (university studies) and older educational programs which are comparable".